This year was also an opportunity to step back and look at the industry as a whole, and our role in it. When we started the company in 2009, our work was largely focused on period-correct restorations for classic car collectors. 10 years later, our vision has evolved along with the changing tastes and desires of our clientele. Today, our clients not only want to preserve these beauties, but they also want to enjoy them actively with their friends, families, and to pursue different on- and off-road activities – all while sharing the road with more modern vehicles. In that context, we must deliver vehicles that are reliable, fun, and comfortable to drive. Speeds are higher, safety is important. Putting the key in the ignition and starting up immediately is a must – in any weather condition. But just as importantly, we have to preserve the essence of the classic Land Cruiser. That rough-around-the-edges feel. The steel body. The manual windows and mirrors. That unmistakable “clunk” of the doors closing. Yes! The things we love and remember from our childhood, riding in the back of our grandfathers 1982 FJ40. That fine line between classic and modern cannot be overstepped. It’s a delicate balance. So with that philosophy in mind, we bring you our model line up for 2019. Where is the “FJ”? Is this still an authentic classic Land Cruiser? Yes. 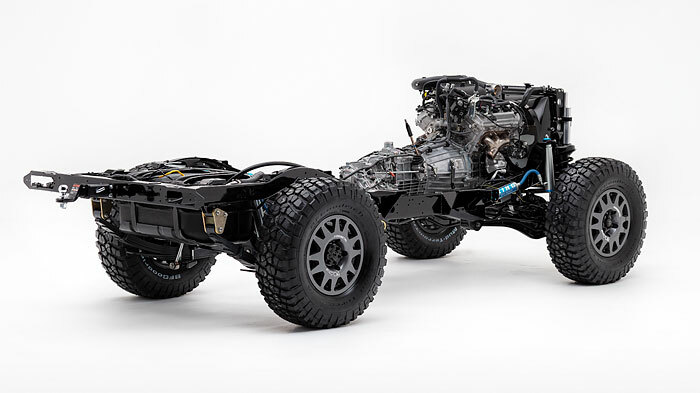 The G40 is based on an original FJ Land Cruiser chassis, that has been reinforced and re-engineered with front coil suspension and a more advanced power steering setup. 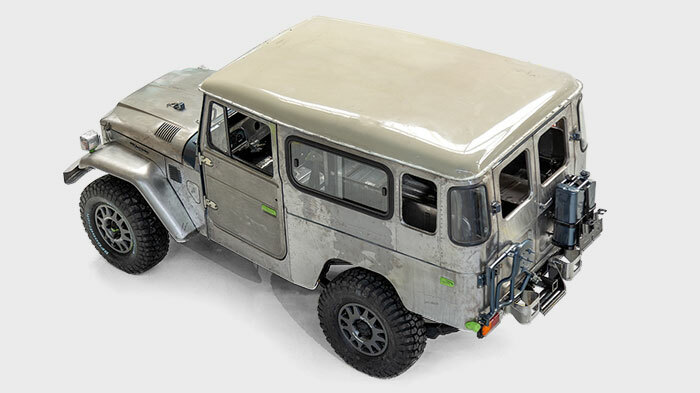 The body comes from an original FJ40, FJ43, or FJ45 from 1976 to 1983, with a couple of customizations to accommodate the new mechanical and electronic features of the platform. For example, the front fenders are slightly wider and the dashboard is completely custom. But overall, G40’s maintain the authentic and classic good looks that our builds are known for. Where does the “G” come from? Staying true to the Toyota naming structure, the model name references the engine designation. With the G40, this is where things get really interesting. G40’s have a factory-fresh Toyota 1GR-FE engine, 5-speed manual transmission, and modern Toyota axles. At 228 horsepower, the 1GR-FE 4.0L V6 is a tried and true workhorse from the same family of engines used in Toyota 4Runners and Tacomas. How else is it modern? 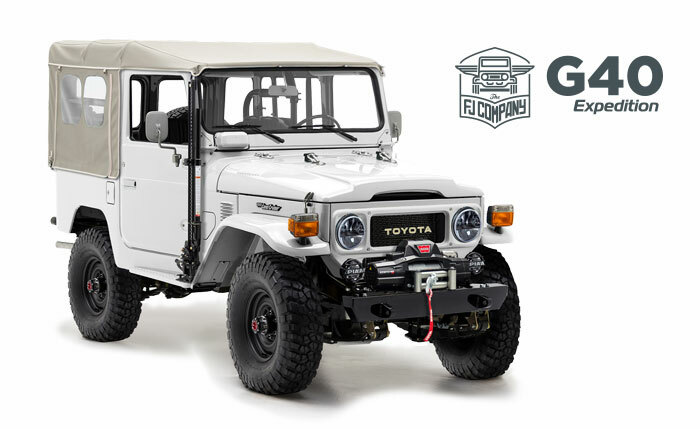 With the body of the classic Land Cruiser and the G platform explained above, we are putting together the best of both worlds. A vehicle that, on the outside, is everything you love about the classic Land Cruiser look, but without sacrificing the more modern comforts of living in the 21st century. The biggest upgrade comes in the form of traction-related features: G40’s will all have automatic locking hubs, anti-lock brakes (ABS), and electronic stability and traction control. Automatic locking hubs allow you to shift into 4×4 without having to get out of the car to manually “LOCK” the hubs (as you would in a stock FJ40). 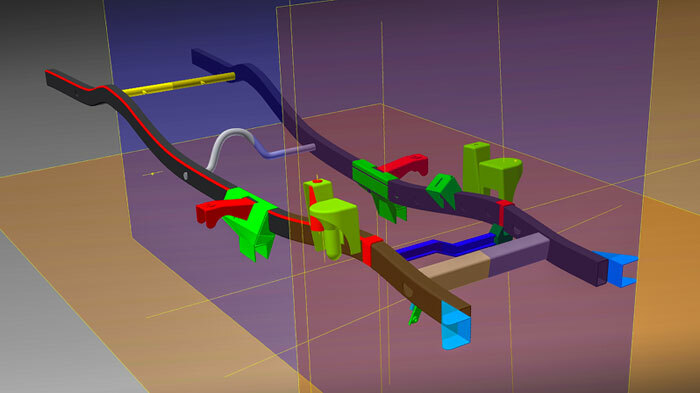 By simply shifting the 4×4 lever inside the cabin, the vehicle will go from 4×2, to 4×4 High, to 4×4 Low. Anti-lock brakes (ABS) will help prevent your wheels from “locking up” in aggressive braking conditions. Stability and Traction Control will limit the possibility of losing control under tight cornering and acceleration. These modern features can be turned off by hitting the “OLD SCHOOL” button, so you can enjoy the vehicle without electronic support. Is there only one option? The Heritage trim is our most classic looking vehicle. It will have classic headlights with H4 bulbs, classic fog lights, traditional wheels with hubcaps, and classic looking bucket seats from Toyota. The Expedition trim is optioned for adventure. It has our Expedition bumper, a beefy Warn Zeon 8 winch, PIAA fog lights, Hi-Lift on the side, and sportier bucket seats from Corbeau. We also included a Tuffy Box as a center console and extra Raptor Lining inside the cabin to keep things protected. 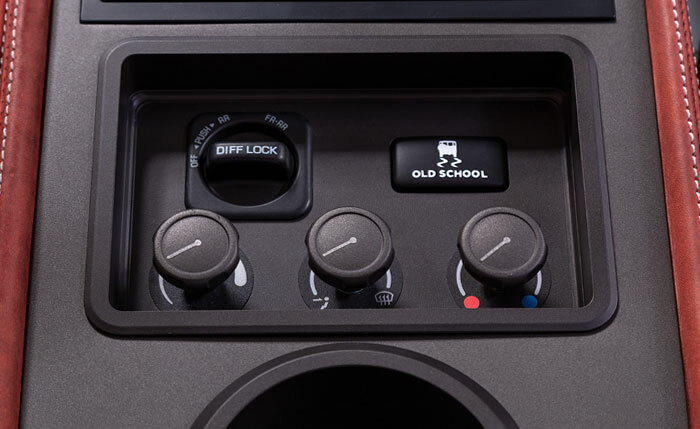 On the mechanical side, we include front and rear lockers by default, a feature that will come in handy in the most severe off-road conditions. And finally, at the high end of the spectrum is our Signature trim. It includes all of our custom designed CNC-machined accessories, including mirrors, shifters, foot pedals, and window levers, and repurposed OEM bumpers with integrated fog lights by Baja Designs. Inside, you’ll find Recaro seats, custom leather, a custom center console, and a premium entertainment system with Apple CarPlay. The Signature version includes KING shocks, Evo Corse DAKAR wheels finished in gun metal gray, and you’ll have the ability to upgrade to the supercharged version, G40-S or G43-S, for an extra 90 to 100 hp. You can see an example here. How much does a G40 cost? The G40 starts at $160,000 for a Heritage version, $170,000 for the Expedition version, and $190,000 for our Signature version. G43’s will have a $10,000 premium over the base model and G45 Troopy’s have a $15,000 premium over the base model. Pricing still includes our 1-year service agreement and delivery within the Continental US. Lead time is currently 12 to 18 months. Will the Classic and Sport still be available? 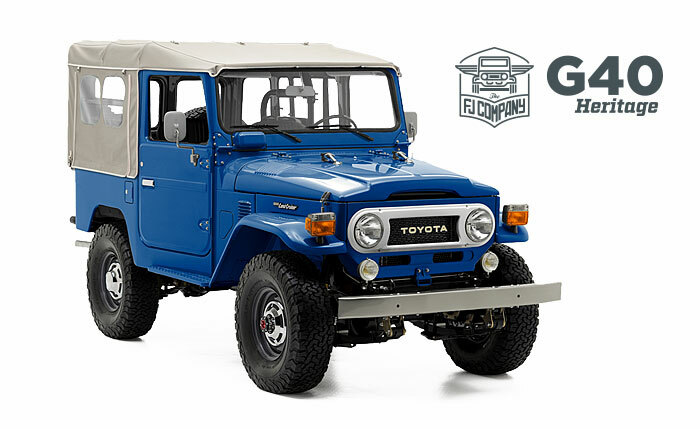 The FJ40/43 Classic and Sport models will continue to exist, but we’ll build them on an ad-hoc basis. So if you are set on having the 2F or 1FZ engine, contact us to discuss a custom build. Prices start at $150,000. For clients that currently have a Classic or Sport in production, those trucks will be delivered as ordered and we’ll continue to support them in our service program. 2019 will also be the first year of The FJ Company Experience. An exclusive event that will bring together our clients from around the country to enjoy 2-3 days of guided on- and off-road terrain. This is an opportunity to enjoy your truck in its natural habitat, learn about off-roading best practices, and of course, mingle with other like-minded Land Cruiser enthusiasts. Stay tuned as we announce more details, but it’s likely that our first Experience will be in August 2019, in beautiful Aspen, Colorado! prev postSee you this Summer! 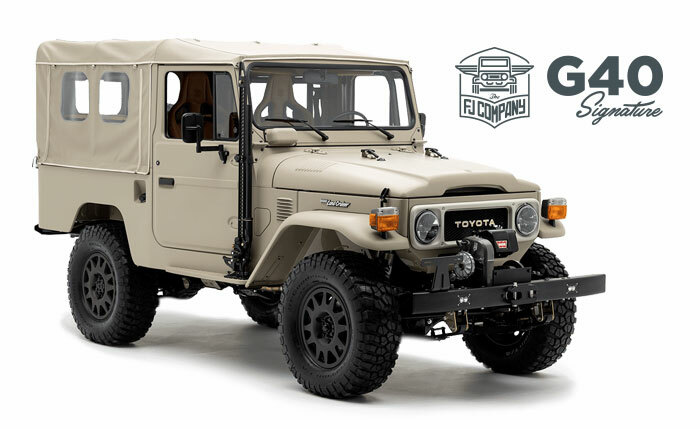 next post Coming soon to a family near you: The FJ Company G45 4-Door Troopy.